I've just installed the latest Beta for Windows 1.6.0.82. It installed smoothly but, like the previous Beta installation, did not require my entering my purchased product key. However, having crashed on first use adjusting curves in Develop persona, I restarted the Beta and received 'Invalid Product Key!' banner. This precludes access to Help menu, so I'm unable to enter a product key. Anyone else? Any suggestions? Something must have gotten written incorrectly during the crash. Would you be able to go to %appdata%Affinity\Photo\ and make a copy of the 1.0 (beta) folder and zip it up then try uninstalling and re-installing the beta version to see if that sort it for you? Would you the be willing to attach the zipped up folder here so we can take a lok into what may have cause this? OK, I've found it! Please ignore screen shot, which I added before I rooted around manually, having enable view hidden folders... How do I zip a folder? I can add to "1 (Betta) .rar" - is that the same thing? Sorry to be a dilly at computers, but I'm rather good at cooking! Hi Lubiloo, can I just ask where did you purchase Affinity Photo from? Second, can you email the following file to support@seriflabs.com. Thank you! Hello. Yes, I bought it online through the Affinity website. I have emailed file to you. I can add to "1 (Betta) .rar" - is that the same thing? Sorry, can't do rar - apparently my trial ran out years ago! Can I do zip, or do I have to pay for that...? Thanks for the email, I see that you've registered the key to your email address ...@btinernet.com (missing the 't' out). If you start the beta now, does it still tell you that the product key isn't valid? If so, can you email the licence file in the C:\Program Files\Affinity\Affinity Photo Customer Beta directory too? Can I confirm, when you installed the beta, you weren't prompted to enter a product key? If you start the beta now, does it still tell you that the product key isn't valid? Confirmed: .xml file emailed. Affinity still 'invalid...'. Product key not requested on installation of both Beta versions since purchase. Yes, it is installed in the same Programme Folder as Affinity Trial and Affinity purchased. 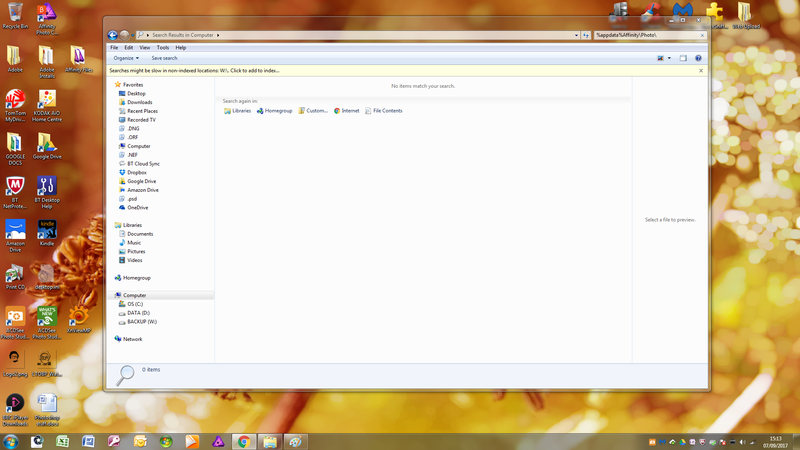 You can zip up a folder within windows itself. Good Grief! Of course I can... Brain pain. Attached. I'm now going to uninstall the latest Beta, restart my computer, run the Beta .ex file and install to a different folder. I'll let you know if that makes any difference. If it does, I'll zip and send. Yes, it is installed in the same Programme Folder as Affinity Trial and Affinity purchased. OK, that's the problem then - you've put 3 programs on top of each other! Glad you've got it sorted now though. you've put 3 programs on top of each other! I am SO sorry. I had no idea that installing to the same folder could cause such a problem... All the time and effort you and ChrisK have put into sorting this for me: I do feel such a twit.